A few days ago I was contacted by Dwight Kubach (aka kgambit), content editor of the great Thieves Guild website about a project I might consider for my Readable Books. He asked if it was possible to make a spell book that contained spells for wizards to find and copy. My first reaction was that it should be fairly straight forward and I decided to give it a shot. After I started, it soon became obvious that the project was not going to be as quite straight forward as I first thought, especially as my knowledge of XML coding is still quite basic. However, with the knowledge I do have, I managed to hit on a workable solution. It may not be the best way to do it, but at least it works. 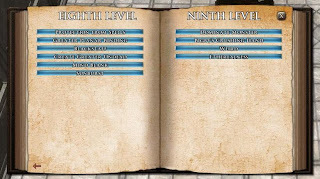 I had to make some design choices, such as the maximum number of spells that could be found in any one book, but after some more communication with Dwight, I believe I have found a combination of random spells per wizard level that should do the job well. 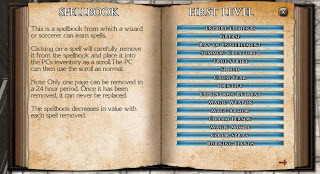 However, for those who like to tweak the spell books themselves, I have added some parameters that can be set at build time that can tell what limit of spells the book will have in it, and I hope I will eventually code in variables that allow the builder to specify the exact spells found if they wish to. 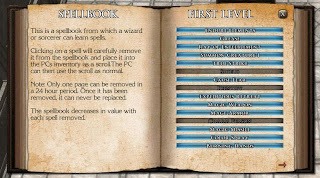 I hope also to code a value system for the book, representing the spells that are in the tome, gradually decreasing for each spell removed. I think there could be a lot of potential for this item, especially if I can get the coding to allow a DM dynamic control within a gaming session. My thanks go to Dwight who helped encourage me to look at this idea, as now that it is underway, I can see it will be very useful and hopefully well received in my own campaign. I still have a little more work to do on this yet, but as soon as its done and gone through some testing, I will post it on the Vault. great job you've done there. I had the honor to beta test it and could not find any faults or bugs after excessive testing. Thumbs up. Thanks for the testing. I will give you some credit in the manual for that. Let me know how playing with it comes along if you ge the chance.